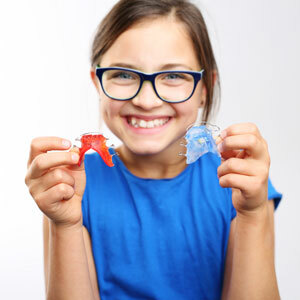 Part of our orthodontic services includes growth phase orthodontics, which allows us to expertly asses a child’s mouth, face and jaw to determine whether early intervention is appropriate for them. While a child is still growing and developing, it is much easier to address common issues such as cross bite, teeth crowding, or the inadequacy of space for adult teeth to erupt. As such, the jaw can be modified to avoid the need for tooth extraction, surgery, or more complex procedures later in life. We utilise a number of orthodontic appliances to correct these issues, including plates, partial braces, or retainers. If you’re interested in achieving a more functional and beautiful smile for either yourself or your child, please schedule a consultation at KR Dental today!